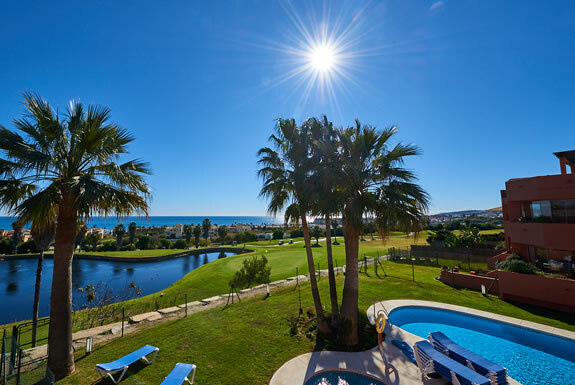 A two bedroom first floor corner apartment with a spacious terrace directly overlooking the 17th & 18th holes of Dona Julia golf. 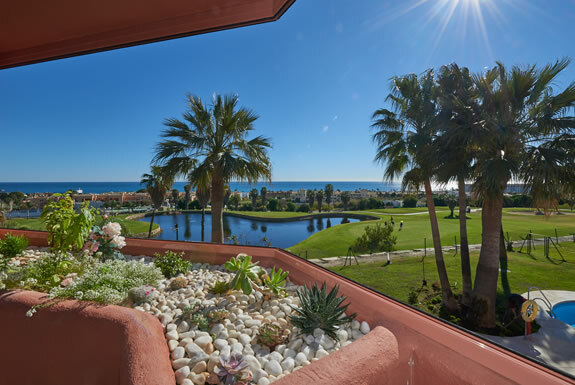 Enjoying 270 degree views over the golf course to the Mediterranean sea in the distance. 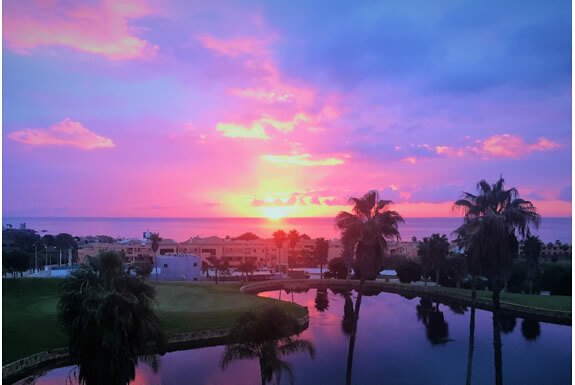 This is the perfect place to relax and watch the sun go down. 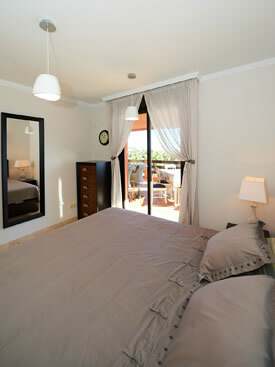 Dona Julia is within walking distance of the sun kissed sandy beach of Playa Ancha. 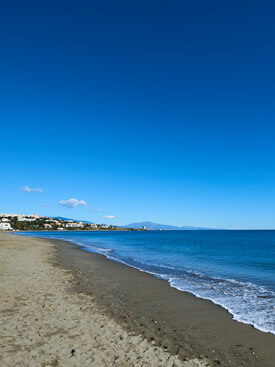 The nearby small town of Sabinillas has been awarded the blue flag for its clean and safe beaches. 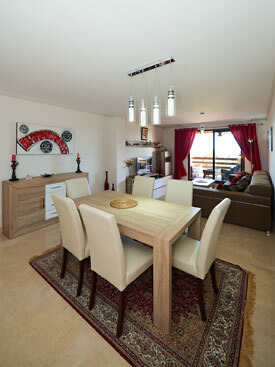 Here you will find many restaurants and cafes to enjoy and it is only a 5 min drive away or a 20 min walk along the beach. 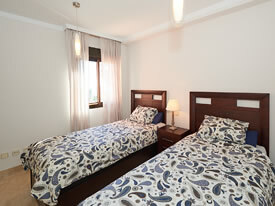 Please note check in is after 4 pm & check out before 11 am at this property. 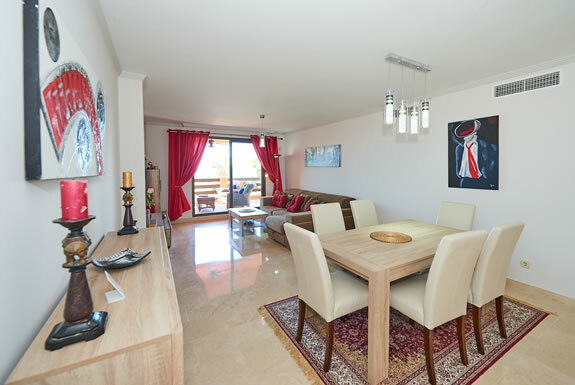 El Patio Don Julia is a two bedroom first floor apartment for 6 guests. 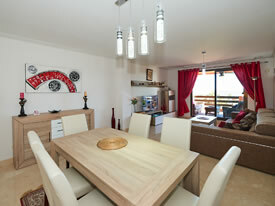 The apartment has been tastefully and comfortably furnished. 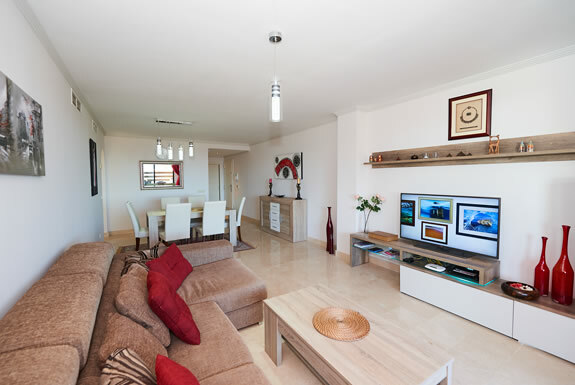 In the lounge there is a smart flat screen TV with IPTV (internet television with many channels) and a DVD player. 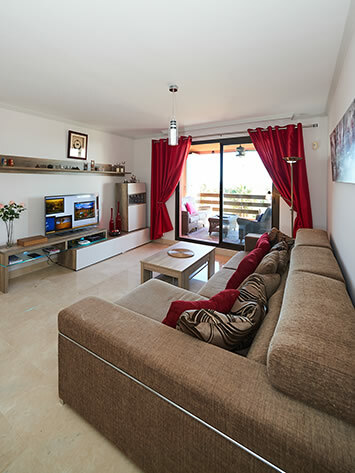 Here you will find the sofa bed for two guests. 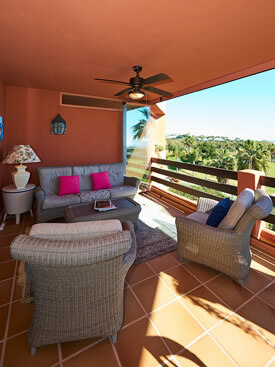 The lounge opens onto the terrace that runs the full length of the property. 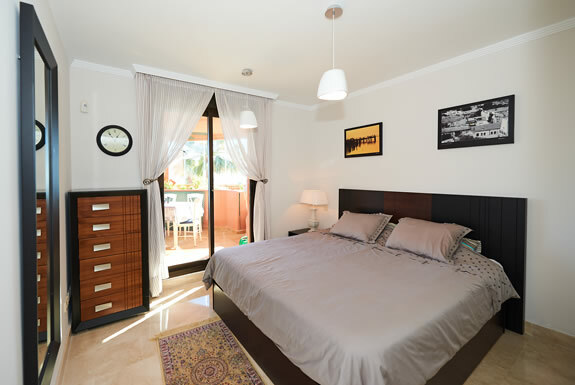 The master bedroom has a super king size bed and opens directly onto the beautiful terrace at the front of the property. 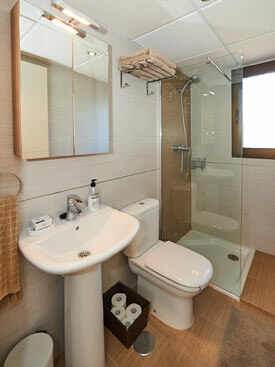 This room has an ensuite bathroom with a hydro spa bath, a separate walk-in shower, wc and bidet. 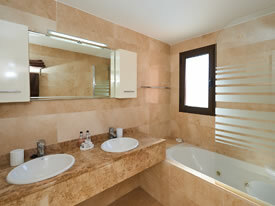 The twin bedroom has the use of a shower room with a walk in show, WC and basin. 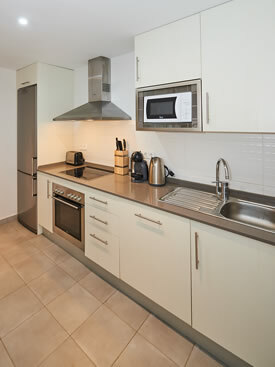 The kitchen is well equipped and is complete with electric ceramic hobs (stove tops) and electric oven, sink, microwave, fridge & freezer, coffee machine. 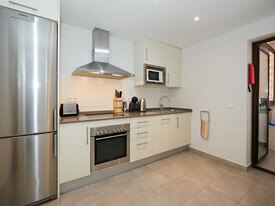 The washing machine is in a separate utility room off the kitchen. 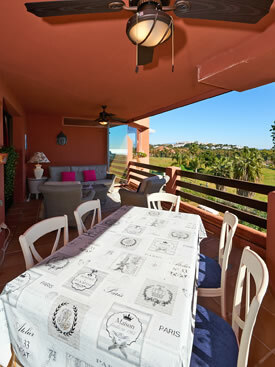 Taking time to enjoy the sunshine whilst savouring a leisurely lunch is very much part of the lifestyle in Spain. The shaded terrace has a comfortable seating area as well as a dining table overlooking the golf course. 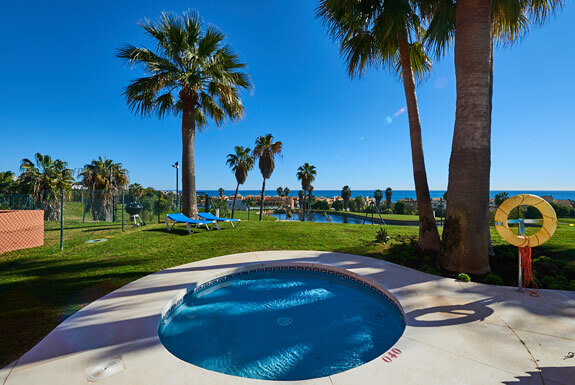 With the blue waters of the Mediterranean in the distance this is a perfect place to share a glass or two of Rioja with your friends and family. This terrace benefits from glass curtains so it can be enjoyed all year round. 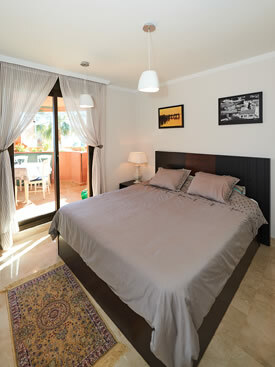 There are plentiful sun loungers around the communal pool & children's pool. 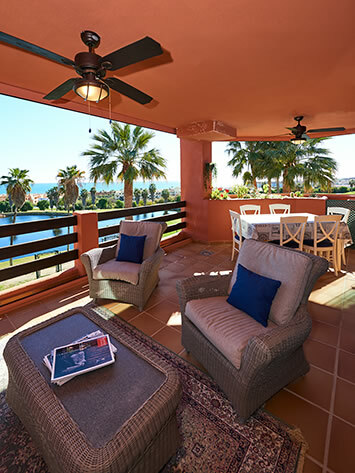 So you can relax, soak up some Spanish sun, and let your worries melt away. Just a short walk from Patio Don Julia is a lovely beach called Playa Ancha. 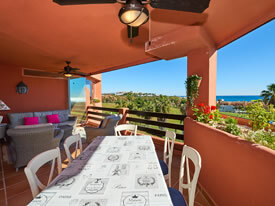 With a great Chirringito 'Marina Playa' it is a perfect place to enjoy a cold drink after a day on the beach. An enjoyable walk down the beach is one of my favourite beach restaurant, La Sal, which is very popular with the locals ... fresh fish, paella & sangria! 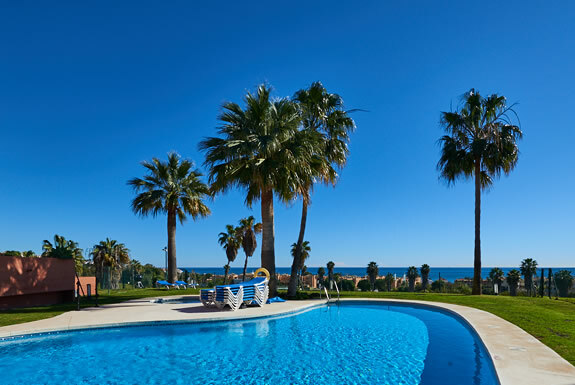 Enjoy a sun kissed day on the beach, relax on hired sun beds, splash in the waves, eat a long leisurely lunch and siesta in the shade. 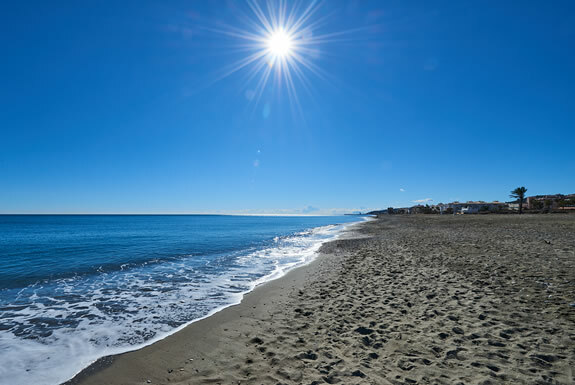 Only a few minutes by car or taxi you can reach Estepona which has a wide range of beaches from the popular La Rada in the centre, peppered with beach bars & restaurants to the family friendly El Cristo beach, just outside town. This beach is perfect for children, set in a delightful sheltered cove. There are also two new beach "chiringitos" that serve mouth-watering snacks and seafood. 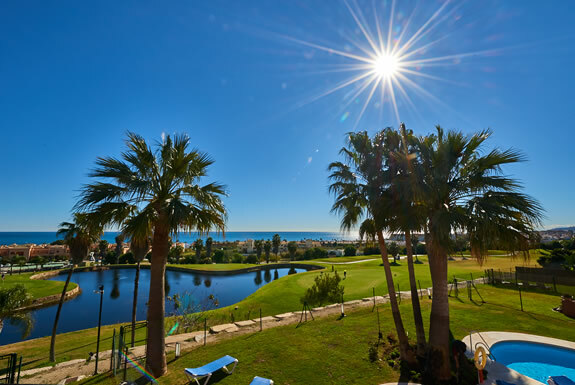 Estepona Marina also has a wide selection of bars and restaurants to choose from. I love fresh seafood and my favourites are La Escollera in the fishing port (to the right of the main port) and Le Briconnet del Puerto next to the Club Nautico.